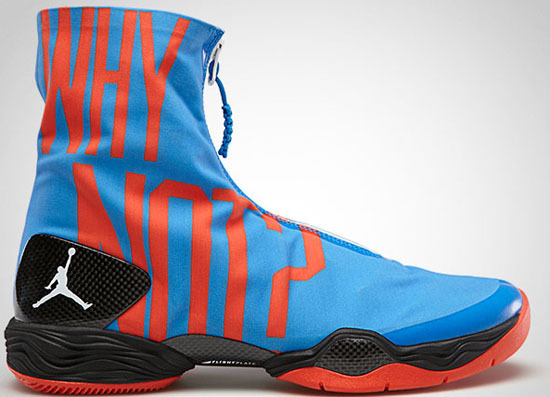 After this weekends releases, another "Russell Westbrook" edition of the Air Jordan XX8 is set to drop. First previewed here back in March, this Russell Westbrook player exclusive edition of the Air Jordan XX8 is officially set to release. Known as the "Why Not?" edition due to the phrase being featured on the shroud upper. They come in a photo blue, white and black colorway. Featuring a photo blue based upper with orange, white and black accents. 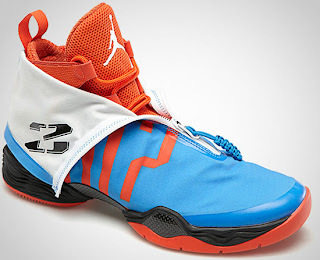 This is the third Russell Westbrook edition of the Air Jordan XX8. A limited release, they will be available at select Jordan Brand accounts worldwide on Saturday, June 8th, 2013. Retail is set at, $250. Enjoy the official images of the Russell Westbrook "Why Not?" Air Jordan XX8 in photo blue, white and black below. Those of you interested in picking these up when they release should check in with their local spots to see if they will be receiving them. If you're looking to lock down a pair now, you can click here to buy them on eBay.